With the new year mere days away, it feels like everyone is getting excited for what's to come in 2017. New plus size clothing collections are certainly a reason to get excited, and as more and more stores cotton onto the importance and cost effectiveness of plus size ranges, there's sure to be bigger and better clothing lines coming down the pipe. 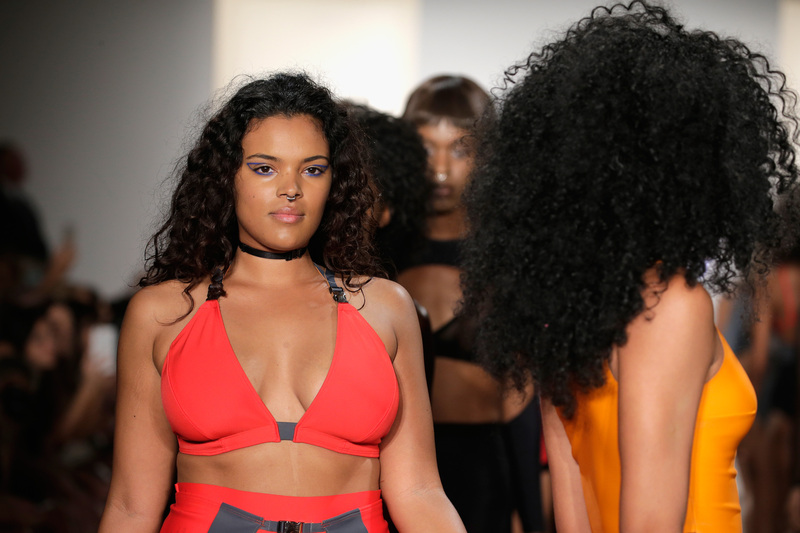 2016 saw the most diverse New York Fashion Week runways ever, both for size and race, as well as the launch of Beth Ditto's eponymous plus size fashion line and numerous plus size collaborations from the likes of Ashley Nell Tipton to Ashley Graham. This year has set the bar high for plus size fashion, but it's sure to keep getting better in 2017. Though you might be inclined to tighten your purse strings in the new year, you might want to hold off on that resolution and prepare to spend some well-earned money on yourself on some stunning new plus size clothing collections that you just need in your 2017 wardrobe. Start the year as you mean to go on: Well-dressed and ready to bask in the glory of what's happening in the plus size fashion world. While Nike already stocks a basic plus size line, the sportswear brand promised to extend their plus size options in 2017 — in fact, Nike are doubling their plus size range by spring 2017. A collection that is going to be highly anticipated by all plus size athleisure lovers. Not just a plus size collection, but a plus size subscription service — Stitch Fix are set to launch personal styling subscriptions for plus size women in 2017 according to Parade, which will not just give plus sizers advice, but a whole load more choices than other brands may offer. Set for next spring, you can sign up for updates on the Stitch Fix website now. Another brand using next spring as a starting point for their plus size range is. According to Refinery29, designer Tracy Reese is providing plus size clothing in their range in the early months of next year. While the line will only go up to a size 18 and a 2x, this is still a step forward for a brand (however small) that only went to size 12/L previously. Culturess applauded Tadashi Shoji for dressing plus size celebrities for years, and positively jumped with joy over Shoji's spring/summer collection for plus sizes and straight sizes alike. And while the designer brand didn't feature their plus size line on their spring/summer 2017 runway, the brand's plus size collection is always just as visually stunning. It just makes it more exciting to wait for it to launch while we know little about it. Christian Siriano notably used five plus size models in his spring/summer 2017 runway and by showing what his designs look like on plus size frames, he built the anticipation for when this line actually launches next year. He regularly makes clothing in a large range of sizes, but the runway presentation makes the spring/summer '17 one seem like one to especially get excited about. According to Vogue, the Chromat spring/summer 2017 collection debuted on the runway as one of the more diverse catwalks at NYFW with some truly killer designs. Since then, Chromat's 2017 collection has been highly anticipated and is definitely one to keep your eye on. Chromat's Curve collection goes up to a 4x, proving the inclusivity is more than just a stunt for the runway. In 2016, Bryan Lars premiered his first plus size collection in sizes 14 - 22 and was widely well received, which means his spring/summer 2017 collection for plus size is sure to excite many. In fact, as shown on Essence, Lars' s/s '17 runway featured plus size models and designs alongside the straight size ones and the dresses debuted on the catwalk looked utterly dreamy. Set to launch Apr. 9 next year, Marie Claire reported that the Victoria Beckham line for Target is embracing plus sizes for the first time ever. It's going to be incredibly exciting to see how Beckham's notoriously chic style translates to bigger garments. The Prabal Gurung collection for Lane Bryant was announced in July 2016, which may explain why you've forgotten about it. But set to launch in March 2017, it's definitely one to get excited about — designer outfits at Lane Bryant prices, what's not to love? So slacken those purse strings and get ready to ignore any thrifty New Year's resolutions, because it looks like there will be plenty to spend on in plus size fashion in 2017.